Who Was Edward John Chipperfield? 'What's in a name?' I hear you say. More pertinently, just who was the Edward John Chipperfield who will be forever associated with the splendid Chipperfield Ranges, located at Baldwin's Gate? Please, read on, and indulge yourself in this brief insight into the WW1 exploits of one Edward John Chipperfield. The transcripted text that you will read below, was originally published by the Sentinel Newspaper on Saturday 8th March 2014. The Sentinel Newspaper, based in Stoke-on-Trent, ran a short series of articles depicting the escapades of members of the armed forces during WW1. These articles were published as part of the WW1 Centenary Events. 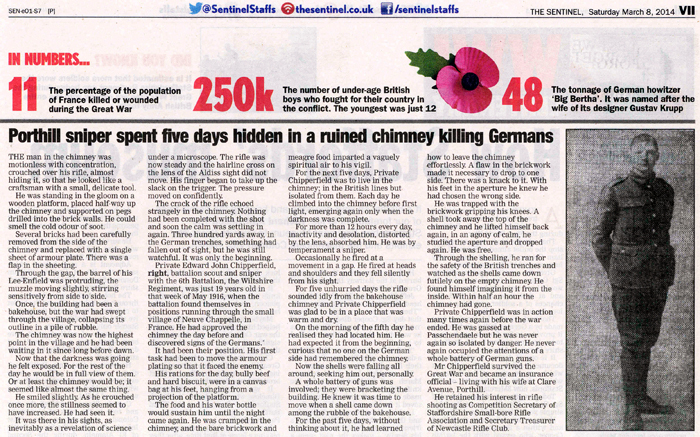 The above picture shows the article published in the Sentinel Newspaper on Saturday 8th March 2014, which gives an account of the WW1 exploits of Edward John Chipperfield. 'The man in the chimney was motionless with concentration, crouched over his rifle, almost hiding it, so that he looked like a craftsman with a small, delicate tool. He was standing in the gloom on a wooden platform, placed half-way up the chimney and supported on pegs drilled into the brick walls. He could smell the cold odour of soot. Several bricks had been carefully removed from the side of the chimney and replaced with a single sheet of armour plate. There was a flap in the sheeting. Through the gap, the barrel of his Lee-Enfield was protruding, the muzzle moving slightly, stirring sensitively from side to side. Once, the building had been a bakehouse, but the war had swept through the village, collapsing its outline in a pile of rubble. The chimney was now the highest point in the village and he had been waiting in it since long before dawn. Now that the darkness was going he felt exposed. For the rest of the day he would be in full view of them. Or at least the chimney would be; it seemed like almost the same thing. He smiled slightly. As he crouched once more, the stillness seemed to have increased. He had seen it. It was there in his sights, as inevitably as a revelation of science under a microscope. The rifle was now steady and the hairline cross on the lens of the Aldiss sight did not move. His finger began to take up the slack on the trigger. The pressure moved on confidently. The crack of the rifle echoed strangely in the chimney. Nothing had been completed with the shot and soon the calm was settling in again. Three hundred yards away, in the German trenches, something had fallen out of sight, but he was still watchful. It was only the beginning. Private Edward John Chipperfield, battalion scout and sniper with the 6th Battalion, the Wiltshire Regiment, was just 19 years old in that week of May 1916, when the battalion found themselves in positions running through the small village of Neuve Chappelle, in France. He had approved the chimney the day before and discovered signs of the Germans. It had been their position. His first task had been to move the armour plating so that it faced the enemy. His rations for the day, bully beef and hard biscuit, were in a canvas bag at his feet, hanging from a projection of the platform. The food and his water bottle would sustain him until the night came again. He was cramped in the chimney, and the bare brickwork and meagre food imparted a vaguely spiritual air to his vigil. For the next five days, Private Chipperfield was to live in the chimney; in the British lines but isolated from them. Each day he climbed into the chimney before first light, emerging again only when the darkness was complete. For more than 12 hours every day, inactivity and desolation, distorted by the lens, absorbed him. He was by temperament a sniper. Occasionally he fired at a movement in a gap. He fired at heads and shoulders and they fell silently from his sight. For five unhurried days the rifle sounded idly from the bakehouse chimney and Private Chipperfield was glad to be in a place that was warm and dry. On the morning of the fifth day he realised they had located him. He had expected it from the beginning, curious that no one on the German side had remembered the chimney. Now the shells were falling all around, seeking him out, personally. A whole battery of guns was involved; they were bracketing the building. He knew it was time to move when a shell came down among the rubble of the bakehouse. For the past five days, without thinking about it, he had learned how to leave the chimney effortlessly. A flaw in the brickwork made it necessary to drop to one side. There was a knack to it. With his feet in the aperture he knew he had chosen the wrong side. He was trapped with the brickwork gripping his knees. A shell took away the top of the chimney and he lifted himself back again, in an agony of calm, he studied the aperture and dropped again. He was free. Through the shelling, he ran for the safety of the British trenches and watched as the shells came down futilely on the empty chimney. He found himself imagining it from the inside. Within half an hour the chimney had gone. Private Chipperfield was in action many times again before the war ended. He was gassed at Passchendaele but he was never again so isolated by danger. He never again occupied the attentions of a whole battery of German guns. Mr Chipperfield survived the Great War and became an insurance official – living with his wife at Clare Avenue, Porthill. Staffordshire Smallbore Rifle Association is delighted to have received a selection of photographs relating to Edward John Chipperfield, which detail his involvement within the sport of smallbore rifle shooting in Staffordshire. Copies of the aforementioned photographs, some of which appear on this website, have been very kindly donated by Richard Anthony Chipperfield Jones, the grandson of Edward John Chipperfield. All connected with Staffordshire Smallbore Rifle Association offer their sincere thanks to Richard for kindly submitting the photographs and documents, and for granting Staffordshire Smallbore Rifle Association permission to use the photographs on this website. To view the photographs, please visit the Edward John Chipperfield - A Selection of Photographs webpage. Some of you may already be aware of Richard Anthony Chipperfield Jones; for those of you who are not quite certain of just whom Richard is - he was one of the members of the world famous Climax Blues Band. For more in formation about Richard, and his time with the Climax Blues Band, plus his current involvement in the music scene etc., please visit the Richard Anthony Chipperfield Jones website.